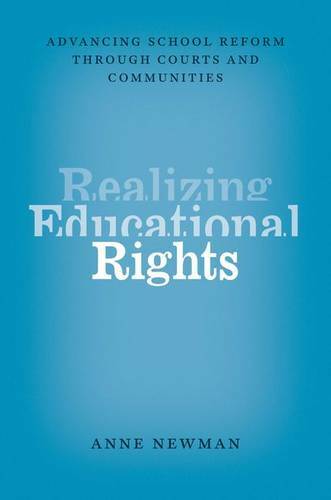 In Realizing Educational Rights, Anne Newman examines two educational rights questions that arise at the intersection of political theory, educational policy, and law: What is the place of a right to education in a participatory democracy, and how can we realize this right in the United States? Tracking these questions across both philosophical and pragmatic terrain, she addresses urgent moral and political questions, offering a rare, double-pronged look at educational justice in a democratic society. Newman argues that an adequate K-12 education is the right of all citizens, as a matter of equality, and emphasizes that this right must be shielded from the sway of partisan and majoritarian policy making far more than it currently is. She then examines how educational rights are realized in our current democratic structure, offering two case studies of leading types of rights-based activism: school finance litigation on the state level and the mobilization of citizens through community-based organizations. Bringing these case studies together with rich philosophical analysis, Realizing Educational Rights advances understanding of the relationships among moral and legal rights, education reform, and democratic politics.